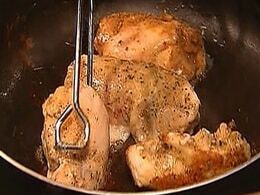 Do you wash your chicken before you prepare it? A new study says rinsing it off actually may do more harm than good. NBC’s Kerry Sanders reports. This content comes from Closed Captioning that was broadcast along with this program. >>> we are back with our health news store i tonight, and as we mentioned, let's be honest here, it's very likely that a whole lot of people just aren't going to believe it when they hear that this new research says washing a chicken, just rinsing it off before you prepare it and cook it, may actually do more harm than good. we get the story tonight from nbc's kerry sanders . >> reporter: the average american eats 81 pounds of chicken a year, and as mom always told you before cooking wash the chicken. even julia child said it was a must. >> run the water right through it inside and out. >> reporter: but now a study by drexel university says that's a huge mistake. >> i mean, i've done this for 13 years. >> reporter: as an animation created by drexel shows, water splatters up to 2.3 feet from the spigot, and those droplets carry with them bacteria like salmonella. >> there are about a million salmonella illnesses and about 378 deaths from salmonella per year. >> reporter: the number one protection, say experts, make sure chicken is thoroughly cooked, and tonight a warning from the government that changes to the poultry inspection process to put food safety in jeopardy. currently up to four usda inspectors monitor 140 chickens a minute, but under an industry-supported proposal there would be only one government inspector , and the line speed could increase up to 175 birds a minute. already the usda has been testing these changes, but in a report released today the gao writes faster line speeds raise concerns about food safety . >> i think that they are putting speed over safety. >> reporter: usda says the new inspection system will reduce the risk of foodborne illness . no washing, new advice that may be hard to swallow in countless american kitchens. kerry sanders , nbc news, ft. lauderdale.